In these settings, interest remains in new agents that may provide advantages in efficacy or safety beyond those of currently available RA drugs. Sarilumab is in advanced clinical trials and a licensing application for its use in the treatment of patients with moderate-to-severe RA is under FDA review, with final FDA approval expected in the second quarter of 2017. The following discussion describes evidence from clinical trials demonstrating the safety, efficacy, and patient-related outcomes of sarilumab in patients with moderate-to-severe RA. In light of the recent results from the MONARCH study, which demonstrated the superiority of sarilumab monotherapy over the TNF inhibitor adalimumab, the balance has tilted in favor of the use of IL-6 inhibitors in patients with moderate-to-severe disease activity who are not candidates for methotrexate therapy (because of intolerance or inadequate responses to this agent) and for whom biologic DMARD monotherapy is indicated. Combination therapy with methotrexate may not be appropriate in several clinical settings, including pregnancy, breast-feeding, heavy alcohol consumption, renal or lung disease, or an infection (eg, herpes zoster). Furthermore, TNF inhibitors are not indicated in certain high-risk patient populations, including patients with CHF and patients with a history of lymphoproliferative malignancies.6 The use of non-TNF biologic DMARDs, such as sarilumab, may fill the treatment gap in these patient populations. Despite treatment advances attained with biologic DMARDs for RA, disease progression often persists in patients who have an inadequate response to or are intolerant of these agents, or because of contraindications related to specific biologic DMARDs, underscoring the need for more effective therapies. With the understanding that IL-6 is the chief proinflammatory cytokine associated with chronic inflammation in RA, IL-6 blockers, such as sarilumab, offer a promising treatment option for patients with moderate-to-severe RA; this is especially true in patients who do not respond to TNF inhibitor therapy; in cases when TNF inhibitor therapy is contraindicated; and, based on the data from the MONARCH study, when the IL-6 blocker is used as front-line therapy in place of TNF inhibitor therapy. Sarilumab is currently being reviewed by the FDA, and encouraging data from clinical trials indicate that this new IL-6 blocker may be an important addition to the RA treatment armamentarium. The challenge for rheumatologists and for payers will be to find the appropriate niche for this agent within an optimal sequencing approach with the currently available biologic DMARDs for the treatment of patients with moderate-to-severe RA. Gibofsky A. Epidemiology, pathophysiology, and diagnosis of rheumatoid arthritis: a synopsis. Am J Manag Care. 2014;20(7 suppl):S128-S135. June RR, Olsen NJ. Room for more IL-6 blockade? Sarilumab for the treatment of rheumatoid arthritis. Expert Opin Biol Ther. 2016;16:1303-1309. Kim GW, Lee NR, Pi RH, et al. 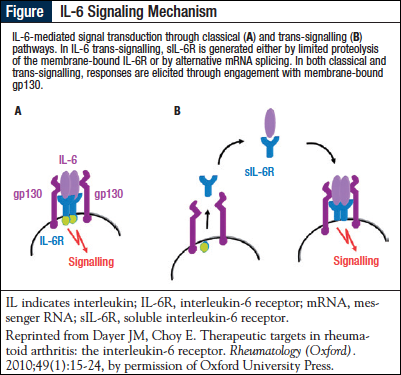 IL-6 inhibitors for treatment of rheumatoid arthritis: past, present, and future. Arch Pharm Res. 2015;38:575-584. Matsumoto T, Tsurumoto T, Shindo H. Interleukin-6 levels in synovial fluids of patients with rheumatoid arthritis correlated with the infiltration of inflammatory cells in synovial membrane. Rheumatol Int. 2006;26:1096-1100. Narazaki M, Tanaka T, Kishimoto T. The role and therapeutic targeting of IL-6 in rheumatoid arthritis. Expert Rev Clin Immunol. 2017 Mar 3. Epub ahead of print. Rose-John S. IL-6 trans-signaling via the soluble IL-6 receptor: importance for the pro-inflammatory activities of IL-6. Int J Biol Sci. 2012;8:1237-1247. Scheller L, Ohnesorge N, Rose-John S. Interleukin-6 trans-signalling in chronic inflammation and cancer. Scand J Immunol. 2006;63:321-329. Gabay C. Interleukin-6 and chronic inflammation. Arthritis Res Ther. 2006;8(suppl 2):S3. Huizinga TW, Fleischmann RM, Jasson M, et al. Sarilumab, a fully human monoclonal antibody against IL-6Rα in patients with rheumatoid arthritis and an inadequate response to methotrexate: efficacy and safety results from the randomised SARIL-RA-MOBILITY Part A trial. Ann Rheum Dis. 2014;73:1626-1634. Rafique A, Martin J, Blome M, et al. Evaluation of the binding kinetics and functional bioassay activity of sarilumab and tocilizumab to the human il-6 receptor (il-6r) alpha. Ann Rheum Dis. 2013;72(suppl 3):A797. Actemra (tocilizumab) injection [prescribing information]. South San Francisco, CA: Genentech; 2010. Smolen JS, Beaulieu A, Rubbert-Roth A, et al; for the OPTION Investigators. Effect of interleukin-6 receptor inhibition with tocilizumab in patients with rheumatoid arthritis (OPTION study): a double-blind, placebo-controlled, randomised trial. Lancet. 2008;371:987-997. Aletaha D, Bingham CO III, Tanaka Y, et al. Efficacy and safety of sirukumab in patients with active rheumatoid arthritis refractory to anti-TNF therapy (SIRROUND-T): a randomised, double-blind, placebo-controlled, parallel-group, multinational, phase 3 study. Lancet. 2017;389:1206-1217. Choy EH, Kavanaugh AF, Jones SA. The problem of choice: current biologic agents and future prospects in RA. Nat Rev Rheumatol. 2013;9:154-163. Taylor PC, Moore A, Vasilescu R, et al. A structured literature review of the burden of illness and unmet needs in patients with rheumatoid arthritis: a current perspective. Rheumatol Int. 2016;36:685-695. Gleason PP, Alexander GC, Starner CI, et al. Health plan utilization and costs of specialty drugs within 4 chronic conditions. J Manag Care Pharm. 2013;19:542-548. Benucci M, Saviola G, Manfredi M, et al. Cost effectiveness analysis of disease-modifying antirheumatic drugs in rheumatoid arthritis. A systematic review literature. Int J Rheumatol. 2011;2011:845496. Joensuu JT, Huoponen S, Aaltonen KJ, et al. The cost-effectiveness of biologics for the treatment of rheumatoid arthritis: a systematic review. PLoS One. 2015;10:e0119683.